Overpopulation means that there are too many organisms of a certain species in a certain habitat. This means that the number of organisms living there is larger than the carrying capacity of the habitat. The habitat cannot support these numbers over time without hurting itself. The term "overpopulation" is most often used to refer to the number of humans living on Earth. 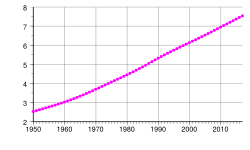 The world's population has greatly increased in the last 50 years. The main reason is the reduction in death rate, especially for infants and children. The result is that many more people survive to the age when reproduction is possible. wider provision of clean water (modern sewage systems etc. ), which reduces parasitic diseases. the world-wide use of DDT, and later anti-pest treatments. the invention of high-yielding varieties of crops and later, genetically-engineered crops. "Humans are 10,000 times more common than we should be, according to the rules of the animal kingdom, and we have agriculture to thank for that. Without farming, the world population would probably have reached half a million by now". Against this background, the reduction in fertility has had little effect, except perhaps in China. The use of the contraceptive pill has transformed the lives of women in the western hemisphere, but has made little impact in third world countries. The recent rapid increase in human population over the past two centuries has raised concerns that humans are beginning to overpopulate the Earth. The planet may not be able to sustain larger numbers of people. The population has been growing since the end of the Black Death, around the year 1400. At the beginning of the 19th century, it had reached roughly 1,000,000,000 (one billion). Rapid population growth occurred all over the world, especially after World War II. By 1960, the world population had reached 3 billion, and it doubled to 6 billion over the next four decades. As of 2011, the estimated annual growth rate was 1.10%, down from a peak of 2.2% in 1963, and the world population stood at roughly 6.9 billion. In 2014, it is over seven billion. Current projections show a steady decline in the population growth rate, with the population expected to reach between 8 and 10.5 billion between the year 2040 and 2050. The scientific consensus is that the present population growth and increase in use of resources is a threat to the ecosystem. The InterAcademy Panel Statement on Population Growth called the growth in human numbers "unprecedented", and stated that many environmental problems, such as rising levels of atmospheric carbon dioxide, global warming, and pollution, were made worse by the population expansion. At the time, the world population stood at 5.5 billion, and optimistic scenarios predicted a peak of 7.8 billion by 2050, a number that current estimates show will be reached around 2030. The solutions usually suggested are better education and widespread free contraception (birth control). Many pregnancies are unplanned (40%) or unwanted. There are powerful forces working against birth control. Religious and traditional beliefs often favour large families. Few governments have tackled the problem seriously. Overpopulation Facts for Kids. Kiddle Encyclopedia.